Please note that if a property owner is being pursued for outstanding prior year’s fees, any payments made will be credited to outstanding balances or may not be accepted based on the account status. Property owners who are currently delinquent are requested to contact management to discuss their account. Property owners who are in a financial position preventing them from paying their 2019 assessment in full by March 31, 2019, MUST send a written request for a payment plan extension either by mail, fax or email to the management company prior to the due date to avoid additional fees. For property owners who are currently delinquent, the balance reflected in the mailed statement may not include all pending late or legal fees. Please contact management for the most up to date balance. Always include the provided coupon(s) with payment(s). Make checks payable to PFMA, (NOT High Sierra Management). Late payment information is found on mailed payment coupon and on the Association website (Collection Policy). Mail payments ONLY to the address on the payment coupon. Payments are NOT accepted at the High Sierra Management location. When paying through a personal bank account, it is VERY important to confirm the payment mailing address is the same as the information located on the mailed payment coupons. Make payments payable to PFMA, (NOT High Sierra Management). Allow up to 7-10 business days for processing when choosing this payment method. Property owners must include the account information as shown on the mailed payment coupons. Property owners have the option of paying online with a credit card or the free eCheck option via a checking account. To make online payments, Click the ‘Pay Assessments Online’ link located on the home page of this website. Important - Property owners must provide the account information as shown on the mailed payment coupons, for all online payments. When paying by credit card, please note that the BANK applies a processing fee. (This fee is NOT applied by PFMA or High Sierra Management). Paying by the ‘eCheck’ option, from a checking account, is free (no processing fee is applied). A ‘one-time’ eCheck payment may be made directly, without creating an account. To schedule ‘recurring’ eCheck payments, the property owner must first create an account. For any questions, feel free to contact the Association Manager, Sherri Carey via the ‘Contact Us’ option on this website. 1st Day of January – Regular assessment is due and grace period begins and ends the 1st day of March. 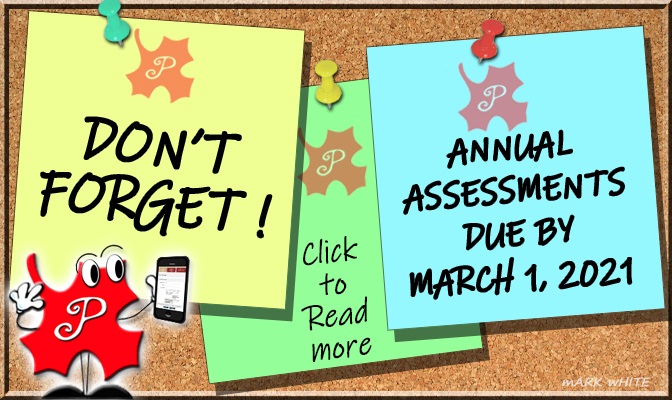 15th Day of March– (Reminder Notice) A letter is forwarded to the owner advising of final due date and fees to be assessed. 15th Day of April – (Lien Notice) Regular assessment considered late and a fee of $25.00, plus interest, processing fee and collection costs will be assessed and a balance due letter will be forwarded to the owner. The letter will include a warning of the impending trash service suspension. 15th Day of May – (Attorney Notice) Additional late fee of $50.00, interest, processing fee and collection costs will be assessed and a demand letter warning of impending legal action and the implementation of trash suspension. 15th Day of June – All delinquent accounts for the current calendar year will be forwarded to the Association’s choice of legal counsel for pursuit of collection. An additional $50.00 late fee, interest, processing fee and collection costs are charged to the account. All costs associated with legal action will be charged to the homeowner account. 1. $25.00 Late Fee plus interest, processing and collection cost. 4. All Costs associated with legal action.